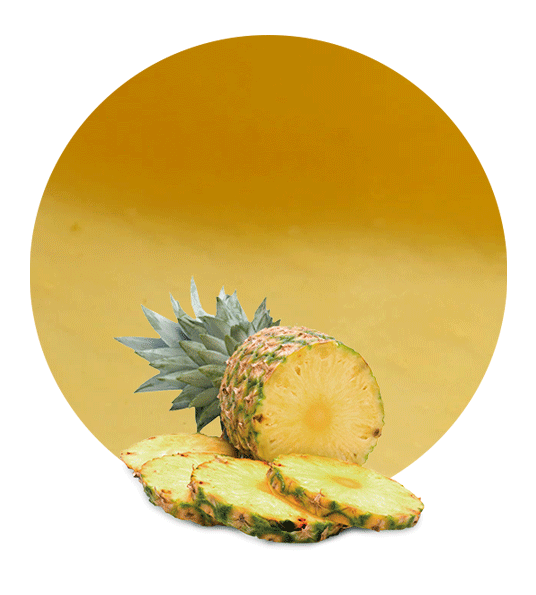 The pineapples we use for the elaboration of our Pineapple Juice Concentrate, which are Ananas Sativus from different origins, are the best quality ones. These pineapples are known to be very juicy and have an intense flavour. Our Pineapple Juice Concentrate is ideal for the production of soft drinks and beverages, and can be reconstituted by dilution with water in order to reach the Brix grades of ready to drink product. We normally pack it in aseptic bags, into metallic, cone-shaped drums, covered with plastic lids. 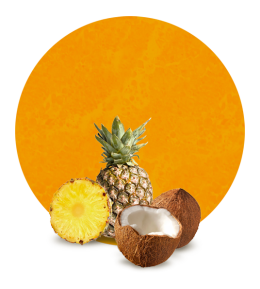 It is recommended for the Pineapple Juice Concentrate to be maintained at a temperature between 4 and 10 degrees Celsius. Pineapples have very few calories, thus they are often used to elaborate diet products in the food and beverage sector. In fact, many diets include eating just pineapple one day a week to purify one’s body. Pineapples are one of the healthiest fruits; it helps to reduce inflammation of joints and muscles, it is beneficial in preventing mouth, throat and breast cancer, boosts the immune system, reduces the risk of arthritis, it is a good remedy for curing coughs and colds, helps to heal wounds, protects against infections, helps improve oral and eye health, reduces risk of dementia and Alzheimer’s disease, protects against constipation, diarrhea and irritable bowel syndrome; and prevents conditions like atherosclerosis, heart attacks, and strokes. All of this may be due to its vitamin and mineral composition, which consists of large quantities of vitamin C, and some vitamin B6, and thiamin, on the vitamins side; and on the other hand, the mineral content consists of manganese, copper, magnesium and potassium. All raw fruit materials are processed in modern production facilities. We offer flexible logistics solutions to give the best service to our clients. We not only supply Pineapple Juice Concentrate worldwide, we supply many other fruit juice concentrates such as orange juice concentrate, lemon juice concentrate, mandarin juice concentrate, pomegranate juice concentrate, grapefruit juice concentrate, apple juice concentrate, and strawberry juice concentrate, among others.